Whether you are planning a brand new bathroom or renovating an existing space, your shower doors are an important part of your overall bathroom design. Glass shower doors can provide a sophisticated and elegant look for your bathroom. In addition, your new shower doors will be incredibly easy to maintain. With the assistance of a company offering shower door replacement near Houston , you will be able to create the beautiful new glass shower doors that you have always wanted. Here is a quick tour of some terrific design ideas for your brand new shower doors. A frameless shower door will add an incredible sense of beauty and elegance to your bathroom. This shower door style is distinguished by its invisible installation. Without a frame, your glass shower door will blend seamlessly into the rest of your bathroom décor. When you install a frameless shower door, you can choose to place your door in the middle of a long glass wall. 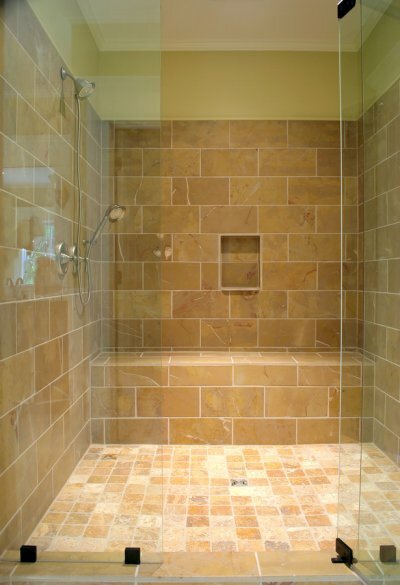 Your frameless door will allow the beauty of your new shower to really stand out. In some cases, you may not need to install an entire shower door. If you have a smaller bathroom, you might want to consider installing a glass splash guard in your shower. This innovative design will prevent water from leaving your shower, while also eliminating the hassle of having to open and close a shower door. Your shower door installation expert can help you decide whether a splash guard will be right for your needs. Reduce your cleaning qualms by trying EnduroShield on your new shower doors. This ultra-thin, transparent coating adheres to the surface and provides protection that will repel both water and oil based stains. This application will also aid in preventing buildup of mold and other harmful bacteria. Consult your Hurricane Glass Houston representative about EnduroShield today!